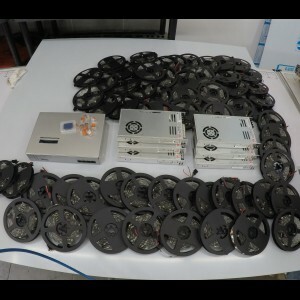 We offer all the accessories and assembling parts for this project and many other LED projects (TOP PRICE TOP QUALITY incl. WARRANTY) so we will assist you for questions and Price inquires. Connect your controller create the CBX file (support questions) and connect 3-4 lines first and test if "anything is working or shining you also can use the SD card of the realtime controller to see if it runs .. 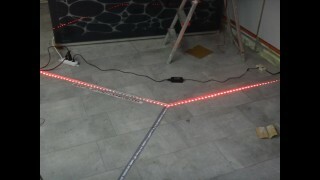 Calculate the length of the LED strip you have to cut, depend on your final requested LED DISPLAY SIZE ! if you want to build a 1000mm high display go on like that. 1000 / strip width + distance = how many strip lines you have to cut /5000mm is one roll then you know exactly how many rolls of WS2811 LED Strip you need for your project ! Now you’re able to cut your calculated numbers of LED strings on your requested length. After you cut all the strings place it to a flat place which is convenient for you to work on it I prefer a huuge Table be careful to not harm your surface if you work on it like we did.. .
we also offer fast connectors to connect the strip without soldering It’s not about cheap fast or slow, it´s about quality and the most robust method is the one i use as you can see. If you wanna use your display portable and carry it around the method should be fix, otherwise you have a lot of maintainance..
Soldering the strips in a series circuit means the start of the first strip is every time INPUT, you can start everywhere you want with the INPUT but later in the software you have to change or setup your PORT. ! Don’t forget to cover a short 20mm pcs shrink tube over the strip before you soldering the wire otherwise you have to remove the solder again and cover the shrink tube it’s easier to cover them before. pull the shrinkpiece far enough inside that the heat will not shrink him to early . After you solder (connect) each strip with the other and make a short test give the strips power and try a test with the LED file on the SD card. or connect the Laptop with an LAN cable to the controller and open the software. Cover the shrinking tube over the solder place and use the Heat gun to make it tightly and secured. After use the heat gun you should bring the strip lines and the connecting wire in ENDPOSITION hold it by hand till the shrink tube will become cold and tight, you can form it as you like, after some seconds it’s tight and will not move again stay in position. ! Now you move the strip construct by side, add your Plane surface to the Table, and clean it careful. 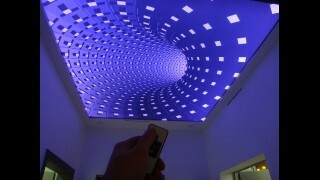 Place your LED strip construct to the surface. BRING IT IN POSITION use the meter stick to fix each distance that the strip construct later Placed well in exactly the middle of your surface. Now you can fix the first LED strip line peel the paper from the backside of the strip (glue), hold one side to the up and start from the other side to fix it. Use your meter stick or caliper to recheck if your strip is straight in position..! IMPORTANT. : If you start to place the first line awry the deviation in the end will be much bigger and later show each awry placements and BIG deviation. Use the Puncher to place a little hole EXACLY under the start of the LED strip Input, put the input wire through the hole. Place the SD controller on the backside of the surface by adhesive tape double sided, connect the wires from the input with the SD controller, connect your power supply and you’re done. 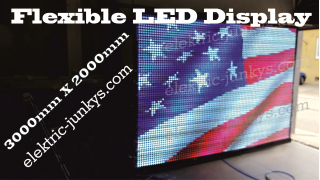 Join, sell, rent, advertise and Publish your stuff on your new WS2811 flexible LED Display curtain with realtime Video controller …. There are many ways to get back your invested Money Time and Power of this Project.